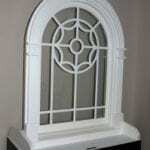 Get the exceptional results you deserve with window grilles that create a custom outcome. If you thought that all window grilles were the same, you are in for an amazing surprise! Here at Custom Glass Products, we craft custom windows with practically limitless options for shape, glass, and window grilles, so we can deliver the exact results you envision. Our custom windows have been the ideal solution for hundreds of homes and commercial properties since we began in 1971, and we are confident you’ll agree that it makes a difference for your window installation or replacement project. We offer SDL (simulated divided light) window grills that provide the look of a true divided light window at a much lower cost. You’ll have a wide selection of choices including various base materials such as Decralite standard, Decralite color core, aluminum, and solid wood, as well as various profile and color choices. Our window grilles are suitable for any size and shape of window, so you can create the window you want for your home or business. Whether you are looking for something unique for your home or business or you are a contractor wanting to provide custom-designed windows with unique window grilles to provide exceptional results for your clients, you can count on us to come through for you. From new construction to renovations, your new windows will provide the benefits that mean the most to you. Our full-service customization means if you can draw it, we can make it! If you have any questions about our custom windows and window grilles or would like to arrange a consultation to discuss your project, don’t hesitate to contact us.